There’s such a focus on Scandinavia these days. Gritty dramas like The Killing, The Bridge, Borgen and Wallander – along with knitted jumpers from the Faroe Islands – have handed the Nordic nations a cult following. Sweden, Denmark and Norway all have their own culinary delights, but here, I’m going to show you some of the best foods from Norway – the country that doesn’t bother with serious, gritty dramas, but instead gives us the fantastic Troll Hunter and Lillehammer. Also, I’m partly from there. They might not look much, but these grey potato dumplings – that go by many names, including raspeball – are an absolute treat (and ridiculously labour intensive). Proper winter food, they’re served with slow roasted, salted lamb that melts in your mouth, sausages and carrot and swede mash. Poured on top, the liquid fat from the lamb (or, if that freaks you out a little, melted butter does the job). You might at this point be thinking that this dish is a little calorific. It sure is! All the calories you’d need for labour intensive work in the freezing winter months. These days, it’s served as a special winter treat, but you can get them most days in Stavanger restaurants (though not ALL days, so check ahead if you ever visit). The translation for this name is ‘World’s Best Cake’ – and it is. It might be a surprise that we’re going to desserts so quickly, but Norway has such an array of tasty sweet delights it’d be criminal not to. Verdens Beste is best thought of as a cake topped with meringue, featuring both whipped, sugary cream and custard. One to avoid when on a diet, but it really is amazing. Norwegians are quite fond of ice-cream – slightly ironic some may think – but you really needn’t have a slab of this cake with anything else. It’s more than delicious all on its own. 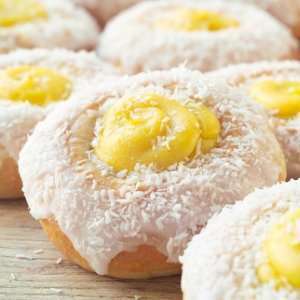 These sweet buns are topped with icing sugar, coconut shavings and a dollop of custard in the middle. The direct translation is ‘School Buns’, perhaps an indication of their original purpose, but these days, any Norwegian patisserie will be making and selling them. Norway has a lot of great pastries, including a type of cinnamon swirl but made from dough and a delicious cinnamon cake usually topped with icing. This spectacular cake is made in several rings of descending sizes, cooked, assembled, topped with icing sugar and decorated in Norwegian flags. The dough is made with almond extract and it’s sweet and chewy. You take a chunk of a ring and just get eating. sometimes you may get cream folded with cloudberries – an orange berry that looks like a raspberry, but has a sweet, honey-like taste, grown only up mountains and quite particular as to the weather they’re grow in. Kransekake is usually just a celebration cake, for birthdays, weddings or confirmation which, despite being an officially secular country, most Norwegians go through, be it a Christian or a secular service, as a teenager. A great benefit of this ceremony is a load of money and very tasty food. The flags may be striking to people from countries not very nationalistic – like the UK – but Norway is very proud of its identity and values. Part of this may be explained by its occupation by the Nazis during the Second World War. So there you go, a veritable feast of calorific amazingness. So with summer over and winter fast approaching, stock up now.